HOUSTON: The Zoroastrian Association of Houston celebrated the Grand Opening of the first fire Temple to be built outside India, Pakistan and Iran and included the Navroze (the Iranian New Year heralding the first day of Spring) in 5 days of celebrations from March 20 to 24. The Bhandara Atash Kadeh (fire temple) is a new addition on the site of the vast ZAH grounds on West Airport near the Beltway and is a result of decades of planning and was made possible by the generous donation of Feroze and Shernaz Bhandara. Vada Dasturji Khurshed Dastoor (High Priest of Iranshah in Udvada, India) traveled from India to lead the ceremonies, prayers and blessings throughout the planned events. Traditional ceremonies included the collection of sandalwood and ash for the fire, a procession lead by local Mobeds, Ervads and Naavars (priests) who carried and urn with fire and ashes from the small prayer room located in the community center to the Bhandara Atash Kadeh where the fires were mixed in new urns. The inauguration and gala celebration on Saturday, March 23 began with the American National Anthem by Chloe Choudhury and blessings by Vada Dasturji and was followed by speeches, award ceremonies, dining and dancing for all. Accompanying the opening was an exhibit “Down Memory Lane” which presented vignettes of past Parsi domestic spaces in India and Pakistan in the library inside the main building. Feroze Bhandara thanked the audience of over 600 for their support. He spoke about the inspiration to build an Atash Kadeh that would meet the spiritual needs of our second and third generations in North America. He explained that he and his wife, Shernaz, felt privileged to have built this fire temple. They want the Bhandara Atash Kadeh to be a safe, inclusive and welcoming spiritual place of worship for all in our community in the hopes that Non-Zoroastrian family members can share our faith and spiritual beliefs thus carrying the Zoroastrian faith onward to the next generation. He concluded by turning over ownership of the Bhandara Atash Kadeh building to the ZAH. Generous donors Feroze and Shernaz Bhandara with high priest from Udvada, India in front of Zoarashtrian Association of Houston (ZAH) Atash Kadeh temple. He acknowledged the Zoroastrian core belief of “Good Thoughts, Good Words, Good Deeds” which is evident throughout this community and gave a reminder to keep the fires burning. He conveyed how touched he was during the first boye ceremony, and that it is now up to the community to take care that this fire burns in perpetuity. Bhandara introduced several key guests and dignitaries including Congressman Al Green (9th District) who presented a Certificate of Special Progression Recognition and Consul General of India, Dr. Anupam Ray. City of Houston Council Members Mike Laster (District J), Martha Castex-Tatum (District K), and Member-at-Large David Robinson to present a proclamation from the Mayor Sylvester Turner. Sarosh Collector, described how the first thought of an Atash Kadeh came to mind from discussion with Roshan and Rohinton Rivetna but that the push to move forward with this idea truly came from Mrs. Cooper (Lahore) and Shernaz Bhandara. adding “atha jamyat, yatha afrinami” (as it is, so shall it be). Other speakers included Fezana President, Homi Gandhi; NAMC President Ervad Kobad Zarolia and past President Sheroy Haveliwala. The Atash-Kadeh architect Cyrus Rivetna (of Chicago) thanked Aderbad Tamboli, Rohinton Deputy, Khushrav Nariman, and others for their support and contributions during construction. The celebrants raised over $100,000 for ongoing operational costs to show their commitment to the ongoing care of the Bhandara Atash Kadeh. MCs for the evening were Mitra Khumbatta and Darius Tamboli. The crowd gave standing ovations to The Children’s Choir, led by Sunday school teacher Vehishta Kaikobad, who performed a Spiritual Song to the tune of “It’s Now or Never” and by musical selections by Chloe and Tayte Choudhury. DJ Gary (Farrokh Firozgary) and the Z-band rocked the dance floor by singing everyone’s favorite tunes and brought the evening to a close. The Zoroastrian Association of Houston was established in 1977 with just over 12 families. In 1998, the Zarathushti Heritage and Cultural Center was built within the 8 acres owned by the ZAH. The Bhandara Atash Kadeh is a standalone, designed by architect Cyrus Rivetna of Chicago is easily recognizable as a Zoroastrian place of worship is located across from the Center and is now ‘must see’ for Zoroastrians, their non-Zoroastrian spouses and children throughout North America. 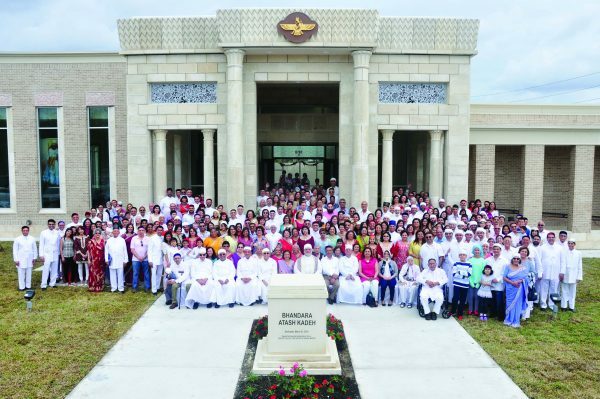 The 7,000 sf building includes a community Prayer Hall, ceremonial rooms and two living quarters to be used for those undertaking their Navroze or first training as priests.